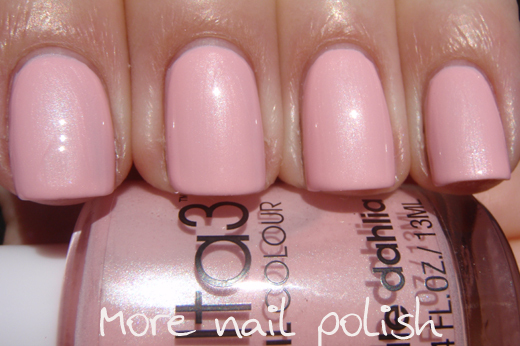 Today I have swatches of the somewhat recent Ulta3 Pretty in Pastels collection. I wasn't able to find this anywhere in store here in Canberra, but the lovely Alanna from Pretty Purple Polish grabbed me the full set from in the city in Sydney. Thanks again Alanna. I have to say that I 'm still not a fan of the PRC made brushes. 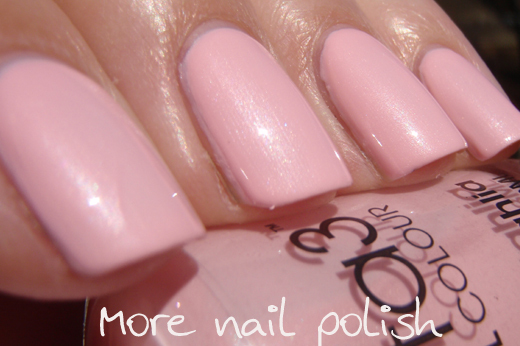 The formula on these was thick and the stiff clear bristled brushes leave drag marks through the polish. Luckily a coat of Seche Vite smoothed most of the ridgy drag marks off. Even though these polishes are on the thick side, I still had I apply three coats for all these pictures, except with Orange Blossom which I had to do four coats. As I was applying and photographing these, I didn't really like them that much, but now that I look back at my photos I've realised that they are in fact really rather gorgeous. 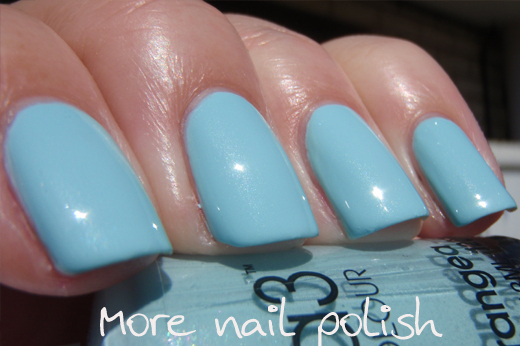 Blue Hydrangea - pastel blue with a pearlesent silver glow. 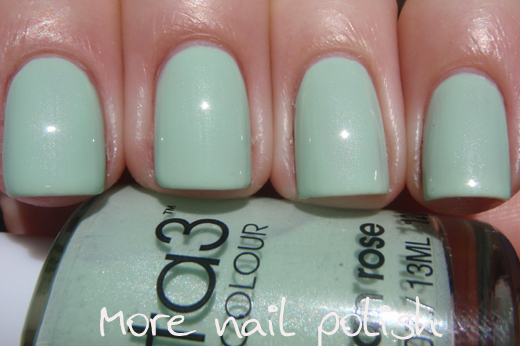 Corsican Rose -pale mint green with a pearlesent silver glow. Lilac bloom - pastel lavender creme. 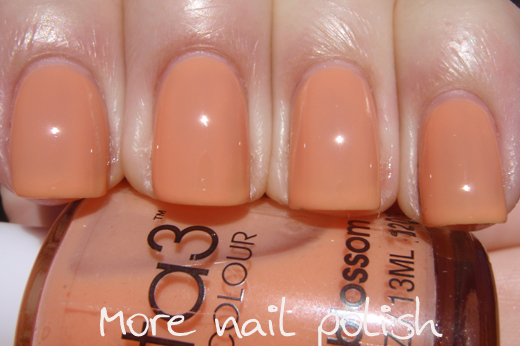 Orange Blossom - light pale orange crelly or sorbet. Pale dahlia - pastel pink with a stong pearlesent silver glow. Pink peony - bright pink creme. A complete odd man out in this collection of pastels. It's like someone at Ulta3 had a brain fart and couldn't think of another pastel colour. These are certainly the palest pastel collection Ulta3 have released. I thought some of these shades might be similar to the polishes from the Spring 2009 collection, specifically Spring Fling, Spring Shower and Natural Spring. But as you can see in my Ulta3 guide, these are much paler. I also wish that instead of the bright Pink Peony they had included a pale yellow - it would have completed the colour wheel nicely. Overall, I like the five pastel shades enough to put up with the thick formula and streaky brush, but pink peony seems a dime a dozen. I've also got pictures of all of these shades paired up with some glitter layering, so I will bring you that post soon. I also thought Pink Peony should have been a yellow. It didn't really fit the theme. These all look lovely. I'm yet to see these shades in my local stores too. Kate, I found the full collection, plus the hibiscus candy cane collection (mentioned by Cleopatra below) at Kaleen Pharmacy in the Kaleen Village and the glitters at Soul Patterson in Gungahlin. Thanks so much for posting these. I'll be off to hunt them all down now. I thought I had found the Spring collection last week but mine are totally different. They are Exotic Canary, Peach Paradise, Tangerine Tango, Coral Reef, Pink Hibiscus, Flirty Bikini, Acapulco Bliss, Sea Breeze Swirl, Calypso Holiday and Pacific Splash. They came in a candy cane for $12.95 although they were also loose in the bins. The logo is now a hibiscus flower over the "a" of Ulta. Any idea what collection these are supposed to be? I love the blue and the green! !